Arabdemocracy: Who Was Shaker Al-Abssi? Shaker el Abssi probably knew he was heading towards a certain death when he declared war on the Lebanese State on May 20th 2007. He claimed on more than one occasion that Martyrdom was an end goal in itself and not a collateral result of his struggle. He might have had visions of his bloated disfigured cadavre as it appeared in the National and International press. While I understand this might have been done in order to put an end to claims he was still on the run I found it unecessary and unworthy of the way the crisis had been handled by the army so far. The photographs also strangely reminded me of the images from the public display of the cadavre of Che Guevara following his death in 1967 at the hands of the Bolivian Army supported by the CIA . I find it difficult to draw parallels between the two men for obvious reasons. While Che has become a positive symbol of rebellion, hope and freedom for millions around the world, it is likely Al-Abssi's memory will be associated with a message of hatred and exclusion in the minds of the majority. On the other hand, both held inflexible ideological beliefs and died fighting for them. Both considered themselves freedom fighters and were motivated by 'good intentions'. I read with interest this biography of Al-Abssi on Naharnet and decided to share it. As it is usually the case, the personal path of this man is more interesting then the end product: A misled deluded killer with no regard for human life including his own. But his story is still a tragedy which mirrors the tragedy of the Palestinian people and the wider Middle East. I feel there is a lesson to be learned and will leave it up to others to draw their own conclusions. Fatah al-Islam's terrorist mastermind Shaker Abssi who was killed in a major showdown with the Lebanese Army on Sunday, is a Palestinian refugee with a battle-hardened and globe-trotting history. In the 1970's Abssi was member of the Fatah guerrilla group, the main faction of the Palestine Liberation Organization. Fatah sent him to Libya in 1976 to become a military pilot. He flew Russian-made MiG jetfighter for Libya in its war with Chad, and fought Israeli forces which invaded Lebanon to drive out the PLO in 1982, his brother Abed told Agence France Presse. But later Abssi turned to radical Islam out of both religious conviction and "frustration" over the failure of the Palestinian cause, Abed told AFP recently in the Jordan capital of Amman where he lives and works as an Orthopaedic surgeon. "My brother is one of them (Islamist radicals). They think maybe Islam is the way to liberation. Everything else failed," he said before his brother was killed on Sunday. Abssi also is wanted by both Syria and Jordan for radical activities, including a plot that killed a U.S. diplomat in Amman. Born in the Ain Sultan refugee camp near the West Bank town of Jericho in 1955, Abssi fled with his family to Jordan after Israel occupied the West Bank in the 1967 war. Abed described his brother as a "brilliant" student in high school who left for Tunis to study medicine, but his main ambition was to work directly for "the liberation of Palestine." Abssi jointed Fatah, the main PLO faction, which sent him to Libya to become a pilot of Russian-built MiG fighters at the air force academy there, he added. "He was very successful. He piloted the MiG 23. When Libya went to war with Chad, he defended Libyan territory with his plane," Abed al-Abssi added. While a medical student in Cuba in 1981, Abed al-Abssi received a visit from Shaker who was en route to Nicaragua "where he was to help train a Sandinista air force. He stayed there for four or five months, I believe." Then during the Israeli invasion of Lebanon in 1982, he fought in the Bekaa Valley as the PLO did not have any planes, before returning to serve in the Libyan air force. In 2002, the Syrian authorities threw him in prison for belonging to a banned Islamist group and for plotting attacks. During his three years in jail, a Jordanian court sentenced him to death in absentia for having taken part in organizing the 2002 assassination in Amman of U.S. diplomat Laurence Foley. Released in 2005, he left for Lebanon, where he was an activist leader for the Fatah-Intifada group, which was close to Syria, in the Palestinian refugee camp of Shatila in Beirut. But months later he chose the path of radical Islam and led 100 armed men to set up base in the Nahr al-Bared camp. There he founded Fatah al-Islam. 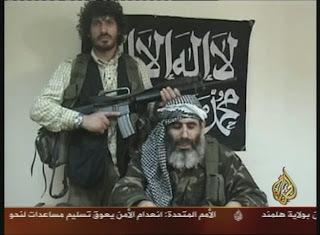 In an interview with the New York Times in March, Abssi pledged allegiance to Osama bin Laden, the fugitive leader of the Al-Qaida network, and said killing American and Israeli civilians is justified.